Condition: Box is in good shape but showing wear. Top right box top corner is starting to tear. Components are in very fine condition. Rules are fairly wrinkled. 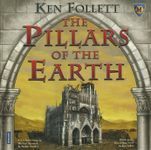 Publisher: Mayfair Games English 1st ed.